High Throughput Screening (HTS) can be defined as a drug-discovery process popular amongst pharmaceutical industry players. This process leverages automation to quickly assay the biological or biochemical activity of a large number of drug-like compounds and is useful for discovering ligands for receptors, enzymes, ion-channels or other pharmacological targets, or pharmacologically profiling a cellular or biochemical pathway of interest. Increasing investment in R&D activities and government initiatives is expected to remain key growth drivers for HTS during the period of study. This report identifies the High-Throughput Screening Market size in for the year 2015-2017, and forecast of the same for year 2022. 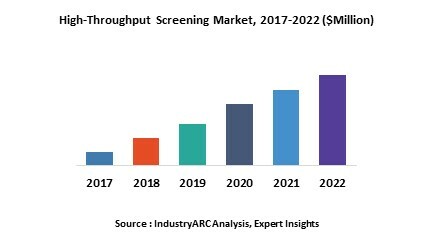 It also highlights the potential growth opportunities in the coming years, while also reviewing the market drivers, restraints, growth indicators, challenges, market dynamics, competitive landscape, and other key aspects with respect to High-Throughput Screening Market. Geographically North America dominated the High-Throughput Screening Market owing to well developed & established healthcare industry, higher spending on R&D activities by large number of global pharmaceutical industry players. North America was followed by Europe and Asia-Pacific as the second and third largest markets for high-throughput screening. However, it is estimated that Asia-Pacific will remain as the fastest growing market for high-throughput screening during the period of study driven by infrastructural development in healthcare sector, growing medical tourism and expanding pharmaceutical industry in the emerging economies such as India, China and few others.